Mark Martin finished 10th in Sunday’s NASCAR Sprint Cup Series race at Martinsville (Va.) Speedway, subbing for injured driver Denny Hamlin in the #11 FedEx Freight Toyota. Martin started 35th on the tough, half-mile ‘paper clip’ and overcame early contact on the track and a pit road miscue to log the FedEx team’s second top-10 finish of the 2013 season in the event won by Jimmie Johnson. Battling a tight race car in the middle of the corner throughout the early portion of the 500-lap race, Martin settled in near the top-20 before sustaining left-side damage after being collected in a wreck in front of him. Luckily, the damage was not severe, and Martin came into the pits for minor repairs. After the race’s midpoint, Martin had moved into the top-20 during a long green-flag run and held off the leaders coming through lapped traffic before another caution. While in the pits for service, the #11 car came off the jack before the left-side tires were secure, causing more damage and a penalty for repairs outside the pit box, and the team lost a lap to the leaders. However, a pair of quick cautions allowed the team to take advantage of the wavearound to get back on the lead lap and then get fresh tires for the final dash to the checkered flag. The car was at its best for the final 100 laps, where Martin moved towards the front to take the checkered flag in 10th. Martin’s finish moved the #11 car into ninth in the NASCAR owner’s standings after six of 26 regular season races. Brian Vickers will fill in for Hamlin this weekend at Texas Motor Speedway, driving the special #11 FedEx Office/March of Dimes Toyota. This season marks the sixth year that FedEx has teamed up with the March of Dimes for a special paint scheme on the #11 machine, and this year, almost 30,000 fans voted on the look of the car. The March of Dimes is celebrating its 75th anniversary in 2013, and nine-year-old Nina Centofanti, the organization’s national ambassador, will be at the track with her family throughout the weekend. The FedEx Racing team encourages everyone to participate in a March for Babies walk, happening in more than 900 communities throughout the country in April, and has set up a team page to help raise awareness for the organization’s mission to help all mothers have full-term pregnancies. 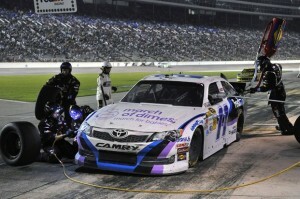 To join the FedEx team, visit www.marchforbabies.org/team/fedex11 to help make a difference. The FedEx Office San Francisco North Market team will be recognized with its “7368″ code numbers on the b-post of the #11 FedEx Office/March of Dimes Toyota this weekend at Texas Motor Speedway. San Francisco North is a leading Sales Customer Service Specialist (CSS) team in the annual FedEx President’s Club program. What was it like to have Denny next to you during practices rather than in the car? How will the learning curve of the new car be impacted with Denny in the car at test events?